In Oregon, backpackers can explore wild beaches, enjoy colorful desert canyonlands, hike amid stunning granite peaks, relax in wildflower meadows, and circle glacier-clad mountains. 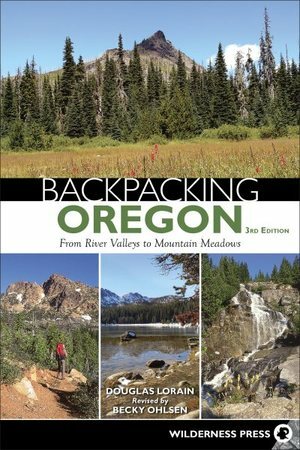 Backpacking Oregon details the premier opportunities across the entire state. Author and hiking expert Becky Ohlsen presents 28 magnificent scenic escapes, whether you have three days or two weeks. See the world-famous Oregon coast; or visit stunning white granite peaks, sparkling lakes and streams, alpine meadows, and the attractive forests of the Wallowa Mountains. Survey the peaks of Mount Hood and the Three Sisters in the High Cascades, and the gaping chasm of Hells Canyon, where you might glimpse black bears or bighorn sheep. Each carefully crafted itinerary offers geographic diversity, beautiful landscapes, and attainable daily mileage goals. This in-depth guide provides all the information backpackers need, including trail highlights, mileage, elevation gain, days on the trail, shuttle distances, required permits, and more—not to mention full-color photographs and detailed trail maps. Plus, ratings for scenery, solitude, and difficulty help you to find the exact adventure you seek. No matter which trek you choose, spectacular scenery and superb vistas await.